I am happy that an excerpt from the Prologue of my book, Reimagining Death, is in the February issue of Parabola Magazine, a journal I have loved for many years. If you have not yet read my book, this is a good introduction and a way to understand more clearly what I am writing about. Enjoy! And all manner of thing shall be well…. I am sitting at my father’s elegant inlaid desk, by an open window looking out on the Alabama land I love. It is late afternoon and countless birds flock to the bowls of water I have put out for them in the forest clearing. Chipmunks scamper beneath the great drifts of fallen leaves, and the place, with one of us home, seems happy and alive again, glowing in warm russet light. Everything is welcoming me back. Early this morning I rose and took a walk across the ravines to our spring, dry and dusty from extreme drought, but a flowing fountain still in the depths of the limestone caverns beneath me. I offered prayers and songs to the spirits of our land, greeting them once more as beloved friends, asking for their support and guidance. I know they hear me. 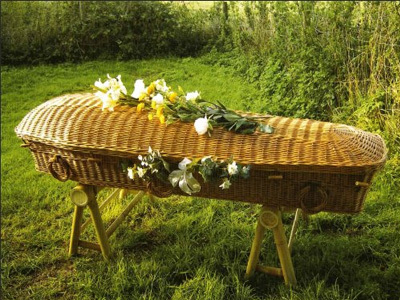 I have returned to my family land to begin work on…a book about caring for our own dead again, as we used to do long ago; about the gifts of home funeral vigils or wakes; simple green burial; and other natural, creative, and innovative ways to care for our bodies after death. It is fitting that I begin my writing here, within log cabin walls that have surely, in their two hundred years, borne witness to many families caring for their own dead. Here, in the beauty of a room overlooking the forest, both my mother and father died: Irobel Herring in 2001, and Harold Herring nine years later in 2010. My family cared for the bodies and souls of our parents after death, rather than entrusting that sacred task to strangers in the local funeral home. “Local” in our area means forty miles away, which is why it made perfect sense, at least to me, for us to do the honors. We—four daughters, one son, spouses, and grandchildren—all “set up” (as Southerners would say) with Mama and Papa for a time. We bathed, anointed, and dressed them, read poetry, and sang hymns. We kept watch, holding them close within the heart of things—our hearts, our hands—until we were ready to let them go. The spirits of Papa and Mama draw in close to me as I write—my ancestors now, still stewards of this place. I have built an altar for them both, to honor Samhain/Halloween/Day of the Dead. It is especially meaningful, for I am here on their land, rather than back home in the Pacific Northwest, where I have lived for the last thirty years. Photos of Mama and Papa rest on the windowsill, near the very spot where each of them took their last breaths, and where they entered the green realms of death on their own terms. The photos are surrounded by autumn leaves, faded and dry now, which rustle occasionally in a silent breeze. A candle flickers, spilling light onto the jiggers of Jack Daniel’s whiskey I have placed nearby to sustain and delight them. I am filled with a quiet and abiding sense of peace and intention. I know that all shall be well. Mama and Papa invoked the words “All shall be well” often in their lives. The saying was a favorite of theirs, attributed to Julian of Norwich, a Christian mystic and theologian from the fourteenth century. “All shall be well, and all manner of thing shall be well”: T. S. Eliot weaves the words into his poem “Little Gidding” from Four Quartets; I weave them in here, for the words have become an invocation and prayer for me in my work now as an alternative funeral director, minister, and home funeral and green burial guide. For me, it is an invocation for healing and wholeness in our relationship to death itself—a chance to transform our fears and heavy thought forms and “return home,” by reclaiming after-death care practices that are more natural, instinctive, nourishing, and ecologically sustainable for all. I offer this saying to you as we turn together toward a contemplation of death—our own, and the loss of those we love. Turning toward death is not easy. Most of us actively avoid thinking about it. We are quite content to push the inevitable down deep, promising ourselves we will get to “all that” another day. But if you are reading these words, something in you is already willing to turn and begin opening the doorway. Perhaps you have experienced the transformative gifts of a home funeral vigil and are eager to learn as much as you can. Perhaps you have heard of the huge environmental impact associated with conventional burial and even cremation, and wish to make different choices when you die. Perhaps working with a funeral home when your mother or father died left you longing for something more. It is my hope and intention that you, as reader, will be inspired and empowered to reimagine the way your body, or that of your loved one, will be cared for after death—and to get those wishes and plans in place long before they are needed. Such conscious intention about our own mortality can help create a greater sense of ease about dying—a knowing that, indeed, all shall be well, no matter what the end of our lives may bring. Being prepared for our deaths enables us to actually turn around and live our lives more fully. In many traditions, the hours and days right after a death are vitally important and sacred. They are viewed as a precious opportunity, a holy interval, when our souls and spirits have enough time and support to fully leave our physical bodies behind. Those who love us are also supported to have real closure and a chance to say goodbye. Here is the third stage of death’s threshold—the time of active dying being the first, and the moment of death being the second. In our fear and dread of “being dead,” we have forgotten the gifts and potential of slowing everything down and being present to all that might emerge in the third stage—that sacred “time out of time.” It does not matter whether this interval is simply an extra hour before the funeral service arrives, a few hours spent adorning our mother with flowers and saying prayers at the funeral home, or a full three- day vigil. The decision is up to us and, of course, dependent on the circumstances of the death. But it’s important to know that it is legally possible to ask for the time we need, and that we have an innate right to make such choices for ourselves and for our loved ones. When I talk about this, people often look at me with a dazed expression. I can tell such inquiry has never entered their minds. We are so conditioned now as a culture to accept without question that the body is taken away immediately when someone dies. In the midst of our grief, we believe we must stop everything and call a chosen funeral service, so that strangers can whisk our loved one away to places unknown, to rooms behind closed doors—out of sight; out of mind, please; and the sooner the better, really, for everyone concerned. If the time is right, that’s when I might share ways we can begin reimagining the way we “do death” in our society. (When I say “our,” I am addressing primarily we of the modern Western world.) Many of us have had hard, if not traumatic, experiences with today’s funeral industry. The growing impersonal corporatization of funeral homes in this country makes the cost of asking strangers to care for our dead increasingly high—financially, emotionally, and spiritually. Yet we don’t know any other way to handle matters when a loved one dies. We have not been educated and informed of all our options (conveniently so for the industry). So we listen to the funeral director and give away our power and right to participate in Aunt Betty’s care. We agree to embalm our father, though the thought of filling his dear body with chemicals is surreal and disturbing. Our beloved mother is sealed away forever in an airtight steel-gasketed casket and then placed in a concrete vault in the ground—both of which obscure the dark, fertile earth waiting to welcome her home. We leave the graveside early and we go back to work and try to get on with our lives. And we wonder why we cannot concentrate on our jobs or focus on our children’s needs, and why we feel so numb and disoriented in our days. We are dying (and living) in profoundly disconnected ways. The circles of real intimacy in our lives are broken, and we have little understanding of how to change. Such separation begins with our relationship to death, which has been banished from the cycle of life, relegated to overfull morgues in hospitals, embalming rooms, and coolers in funeral homes. I am convinced that our fear and denial of death underlies much of our inability to live whole and connected lives. The pace of our days is frenetic and stressed; we live only in our heads and conditioned minds and forget to take care of our bodies, our relations, and the earth whence we come. Nor do we turn to the body and earth for wisdom—something indigenous cultures have never forgotten to do. We are oblivious to our interdependence with all other sentient beings on this planet, and the possibility of communion and co-creation with that great web of life. Cut off from the reality of our own mortality, we are cut off from nature itself and from what it really means to be human. In denying death, we deny the very substance from which we are made—matter, mater, the Mother. This denial is woven with a collective negation of the Feminine in our psyches as well. Such fragmentation makes it very difficult to live balanced lives, and to know the sacred wholeness of who we really are. As I write these words, I feel the danger of spinning out into abstractions of the mind and leaving the body behind. Perhaps you feel the same, reading these paragraphs. It’s a lot to think about, much less try to integrate. And it’s about death—the dreaded enemy who will someday come knocking at our door. Maybe it’s best to go get a warm cup of tea and find comfort for a while. Go outside and feel your feet firmly planted on the ground. It’s earth wherever you are. But come back to these pages, for I have stories to tell, and inspirations that I hope might ease your angst for a time. If we can open to death again, we can learn what it means to co-create with that mystery, with our bodies, our earth, our true natures. In doing so, we can begin to reimagine what is possible at the end of life, and learn how to bring beauty, creativity, life, hope, and healing back in caring for our dead. If we can open to death again, we can learn what it means to co-create with that mystery, with our bodies, our earth, our true natures. In doing so, we can begin to reimagine what is possible at the end of life, and learn how to bring beauty, creativity, life, hope, and healing back in caring for our dead. As I read these words, I think of all the families who naturally and instinctively are “arriving where we started” long ago—and reclaiming the right to care for the bodies of parents, children, and friends after death, in shared and creative communion once again. I celebrate all the remarkable transformative and healing moments I have witnessed—when people, “knowing the place for the first time,” shed their fears of being with the dead, and realize how normal and real and beautiful it can be to show up and participate in a dear one’s care. Touching our mother’s body with love and reverence as we bathe and dress her for cremation. Picking up shovels and pickaxes to dig our friend’s grave ourselves, lining his final resting place with moss and ferns, and singing and crying together as we fill in the dirt and return his shrouded body to the earth. All this within the intimacy of one’s own circles of love, in conscious relationship to land and place, and with awareness and consideration for the greater circles and web of life on this planet. “We shall not cease from exploration.” How true this is for those of us who are saying “yes” to this reclamation and pioneering work together. Many of us are women, which makes sense, as we were the original caretakers of the dead before funeral care became an industry. Many of us are baby boomers, accustomed to doing things our own way, and rebelling against the status quo. Just as we helped create the natural home birth movement in the 1970s, we are now working at the other end of life, demanding that home funeral vigils and natural after-death care be reestablished once again. There is also a younger generation joining us now—calling themselves the “Death Positives” and reimagining even how we have been working, thus keeping our movement alive and generative and relevant for those coming after us. This is to be celebrated. Individuals, families, whole communities are joining together to create a vital network and growing cultural and political movement for innovation and change. The National Home Funeral Alliance and the Green Burial Council are organizations that have formed from these shared endeavors, along with the Funeral Consumers Alliance, which helps protect families’ rights within the funeral industry. New, innovative alliances in the conservation burial ground movement are currently on the horizon, which will generate stronger collaboration between the home funeral movement and those committed to burial practices that restore and preserve land and ecosystems for the future. To me, these are ever-widening circles of wholeness and healing. Though the focus of these organizations and alliances differs, there is a shared vision to educate people about their innate legal rights to choose more natural and sustainable ways to care for the dead; and to ensure that home funeral vigils, green and conservation burials, and other ecological forms of disposition are readily available death care options for the future. I have been blessed to be part of this paradigm shift since its beginnings in the 1990s, and to have experienced the exciting ways individuals and groups are manifesting their passions and shared visions. The level of commitment and willingness to think outside the box and to bring all our gifts, talents, and resources to the table inspires me. Though the work is hard and demanding, and often done without fanfare or recognition from others (as is the case with most pioneering efforts), people in the movement deeply support one another. This makes our efforts more resilient and sustainable for the long run. Probably most of us would agree that Love “drew us,” to rephrase T. S. Eliot’s words—love for a dying family member or friend who asked for more natural care of his or her body; love for land and cherished places in need of conservation; love for planet Earth as a living, conscious being in need of our care. From Reimagining Death by Lucinda Herring, published by North Atlantic Books, copyright 2018 by Lucinda Herring. Reprinted by permission of publisher. Published by lucinda, in Reimagining Death. 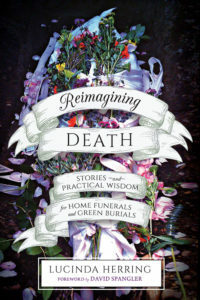 My book Reimagining Death: Stories and Practical Wisdom for Home Funerals and Green Burials is available January 8, 2019 in bookstores across the country, and online through Penguin Random House, Amazon and many other sites. I am happy to say that the book has been reviewed by Publisher’s Weekly and Library Journal, which means it will receive a lot more exposure and publicity in the year to come. The book is riding the wave of a collective interest and enthusiasm for changing the paradigm of the way we “do death” today. The home funeral and natural burial/disposition movement, under the larger name “green funeral movement” is transforming existing funeral industry practices, ones that are increasingly impersonal and toxic to the earth and our environment, and are not sustainable for the future. One of my intentions in writing the book was to highlight the spiritual and environmental cost of modern day funeral industry practices, and to offer more hands-on, creative and participatory ways that care for each other and the earth at the end of life. Please buy your copy today. Thank you! Family and friends can grieve their loss together in a private non-institutionalized setting. A family-directed funeral promotes healing and closure by providing a safe, loving container where emotions can be expressed and held, and where death’s mysteries can be explored with others. Home funerals create the spirit of community as family and friends gather together for support, grieving and life celebration. A vigil lasts as long as the family wishes – from a few hours up to three days. This allows those grieving more time to come to terms with the death, find a sense of closure and create personal and meaningful rituals of farewell with others. Freedom of spiritual expression is available in a home funeral vigil. Whether it is a Christian family singing Amazing Grace over their mother’s body, or a Buddhist community chanting prayers to accompany their friend’s consciousness after death, vigils provide the space and time to create exactly what the departed person, and those left behind, really need. Home funeral vigils create an environment where children can experience death as a natural part of life. Often children lead the way in this endeavor, especially if parents are comfortable with the process themselves. Fears are often replaced by a healing sense of participation in a loved one’s departure. Home funeral vigils encourage active, creative and healing expression, such as building or decorating the casket, or creating special rituals of remembrance. Such direct physical and spiritual connection to the reality of death can deeply aid a person’s journey through the stages of grief. Those who participate in home funeral vigils often go on to prepare their own end of life arrangements, knowing how helpful this is to those left behind. Home funeral vigils are much more cost-effective than conventional funeral options, and can be shaped to fit a family’s lifestyle and budget. Home funeral vigils use dry ice and refrigeration to preserve the body, instead of embalming. Families can choose cremation, green or conventional burial as disposition. 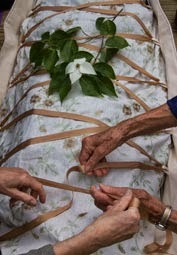 The opportunity to not embalm goes hand in hand with green burials (see below), making home funeral vigils a natural and sustainable death practice very needed today.